Financial year (FY) 2017/18 is coming to a close on March 31st. We had a good run on the exchanges until Jan 2018, followed by the drawdown in the last two months. If you have net realized short-term capital gains this FY, and currently hold stocks which have unrealized losses – you have a tax loss harvesting opportunity. You can book losses by selling your holdings to the extent of the realized gain, and reduce your tax outgo and bolster your returns. For example, assume you have made Rs. 1lk in short-term capital gains this year. You will need to pay 15% of this as taxes or Rs. 15000. Also, assume that you currently hold stocks which are having an unrealized loss of Rs. 60,000. You can sell these stocks to reduce your net STCG to Rs 40,000. You would hence have to pay 15% of Rs. 40,000 or Rs. 6,000 as taxes – saving you Rs. 9,000 in taxes. This exercise will let you harvest your losses and save on taxes – hence called tax loss harvesting. Visit our module – “Markets and Taxation” on Varsity to learn everything about taxation when trading/investing. 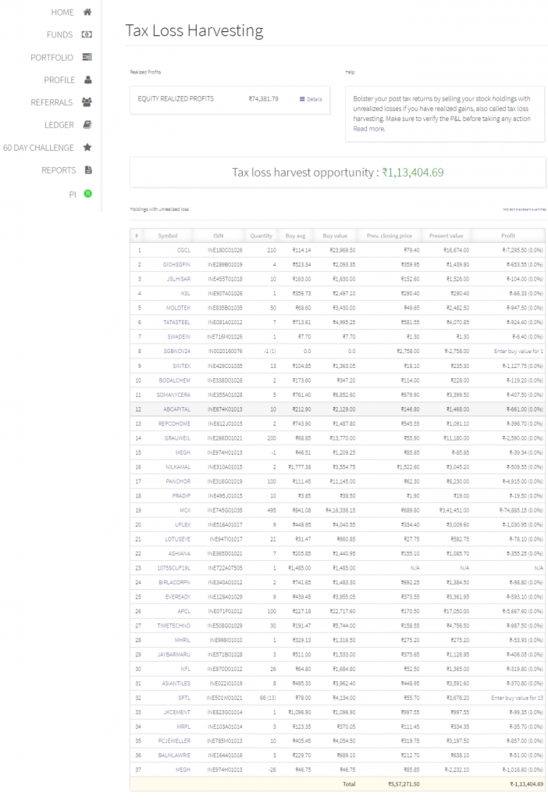 We have created a report for you on Q, which shows the tax loss harvesting opportunity in your account. Using all the trades executed at Zerodha last FY, it shows you the unrealized loss up to the extent of the realized gain as the opportunity. Visit: https://q.zerodha.com/report/tax_loss_harvesting/2017 (the report might take some time to be generated). See below, a sample report. This account has short-term equity profits of Rs. 74,381 and unrealized short-term loss of Rs 1,09.590. We could sell stocks worth Rs. 74381 from the list of stocks and save taxes up to 15% of Rs. 74,381 or save up to Rs. 11,000 in taxes. If you have another trading account with short-term capital gains, you can sell up to Rs. 1,09,590 worth of stocks. You can harvest loss using either of the below actions before 28th March 2018 (last trading day for FY 17/18). You can combine your mutual fund investment P&L along with stocks while calculating the harvesting opportunity. Sell the holdings on one exchange (NSE or BSE) and buy it back from another at the same time. At Zerodha all such trades are settled with stocks moving out of your demat and then getting credited back (hence considered different delivery trades). There is no price risk following this route, but a little grey in terms of compliance (there’s no specific regulation in India which says loss can’t be harvested this way, but some developed markets don’t allow this, hence saying grey). Do consult your CA before deciding. Tax loss harvesting is an exercise followed by savvy traders to optimize returns. Do share it with your friends and family. I only earned through stocks(which was less than 2.5 Lakhs) so will I stillhave to pay taxes? No taxes to pay. You will get the benefit of the tax slab you are on. Just file Income Tax with 2.5 Lakhs, it will show 0 Tax to be paid. That’s it. If my income does not exceed allowed limit (I guess it is 4Lk including the investments) do I have to pay 15% tax on the gains ? No, you get the benefit of tax slab. If your income is at 4lks, you pay only 5%. I have a loss in current year is it compulsory to show in income tax file.. as my other income is not taxable i.e agriculture. So i dont have to pay tax. It is best to file ITR, even if loss. but b now noitce in say that i hve f&o loss 21 LAKH AND SHORT TERM LOSS-188000 AND SPECULATIVE INTRADAY PROFIT WAS -341000 SO OFFICER ASK ME TAX ON SPECULATIVE INCOME 341000 AMOUNT TO 50000 ATX +INTREST ABOUT 16000 TOTAL= 65600 TAX TO BY ME PAY TO INCOMETAX . GO TO PAID TAX IT NO ADJUST IN LOSS ON F&O AND SHORTTERM LOSS.SO PLS GUIDE ME. MY QUERY THAT I HVE LOSS-2100000 &-188000 = -2288000 +341000=1947000 TOTAL LOSS I HVE SO WHY PAY TAX? case 1 : if your income is through intraday, then above Rs. 2,50,000 income is taxable @ falling income tax slab. Case 2 ; if your income is through delivery trades then straight forward 15 % of Short Term Capital Gain Tax imposed irrespective of less than 2,50,000 income. Thank you for more clear answer. @ Nitin, you are doing great. Appreciate. Thanks for making life easier for retail traders and investors. I am a housewife, this year I gained 245000 as short term capital gain, i do not have any other income.Do I need to pay 15% as capital gain tax ? or I am excepted from tax as my income is below 2.5 lacks slab?? No need to pay any tax since you are below 2.5lks. Hi Nithin, So STCG is flat 15% for any amount of income above 2.5 Lkhs ? I am a tax payer with income slab of 4-5 lacs and incurred a loss in options trading in the current year of rs.50,000/-. Do i need to pay any tax or stcg or i can show loss in it filing.. pls guide in this. Yes, you have to pay Short term capital gains at 15%, Intra-day earnings are taxed in a different way so that you can adjust them with your tax slab. Please consult with your CA for proper tax calculation. I have faced 10K losses in nse cash,currency,mcx crude.Do i need to file income tax return asap ? or is it not necessary to file return as i had faced loss ? Can i file itr online or necessary to go for tax aduit farms ? You need not, but advisable to. You are not required to. If my earnings are 2 lk per annum and my long term capital gains are 500,000.Do I need to pay 10% ltcg. LTCG at 10% is applicable from next financial year. If you have any LTCG till now, no need to. if i have incurred losses in trading do i need to file it?? can I just sell my shares CNC and them buy again CNC on the same day? Or Do I need to wait overnight (or 2 days, please confirm) to buy the shares back again? Like i have said, you can sell CNC on one exchange and buy back on another. What is the problem with selling and buying on the same day as CNC? It will be considered as intraday trade, hence no demat deduction will happen. I earned Rs. 245000 this year. Will this money considered as Short term capital gain or other income in the head Income from other source? If you have made this by equity investing, it is STCG. If from F&O non speculative business income. Trade only in commodity segment on delivery based. Pay 15% as a tax or not ? sir i already lost more than 4 lakh in equity due to peny stock (steel exchange)with cont lower ckt . can i utilise it any way as i am govt servent and my saving re already 1.5 lakh this year which is max permited saving limit . hmm.. if it is in circuit, you will not be able to sell and book losses. Thanks a lot NITIN for taking this step. As of now there is a gateway error while accessing the report, but having this report is a bliss for us. Hello, I heard last day for tax harvesting was 27th mar 2018. Please confirm. As 28th onwards trade will be considered in next financial year. 28th is the last trading day for the year. Will it be claimed as Exempt from LTCG as per Guideliness? hmm.. you can, but there is no need to. In any case you get to grandfather all your holdings to Jan 31st price (which was higher generally for all stocks). You have to pay LTCG in future based on the gain from the price as on Jan 31st. Check this. Query 1: I am paying huge amount of STT charges , I am from Chhattisgarh State .how can i reduce that ? I have explained above, harvesting makes sense only if you have realized profits. If you don’t have, no point. The tax loss harvesting report is not getting generated. I feel that if the Gross total Income is below taxaxble limit say Rs 180,000/- and you have Short Term or Long Term capital Gains (besides the above income) of say Rs 30000/- it will BE NOT TAXABLE. I have booked several losses this year to the tune of 2,86,000/- and yet my harvesting is empty at – https://q.zerodha.com/report/tax_loss_harvesting/2017? How can this be? Either the Q link for Tax P&L shows bad gateway or if it does open up and show, I click the Tax loss harvesting, there is nothing mentioned next to “Tax loss harvest opportunity :” in terms of rupees that I can save. Even the “Realized Profits” field is empty. Kindly guide, thanks. It will show a number only if you have realized profits and unrealized losses. Thank U for the response. My CA asks for quarter wise trades done with dates while filing the tax. I have till date not found it. He says it is difficult to file the way I give the zerodha Tax P&L to him in the excel sheet with trades conducted in the FY, but has no date wise/quarter wise data. Why is that? This is for ITR2, I have no other income. The new Q will have the report in the way your CA needs them. The new Q also does not show the Quarter wise report, Can you please let us know ? This is the equation according to you. My question is in order to save 15000 bucks as a tax, one has to sell his or her stocks worth rupees 60000. You have definitely saved 9000 bucks but you have lost 60000 bucks too. Can you please clarify the same or I’m missing something here ? How have you lost 60k? You are just selling and purchasing same stocks again. Value of the loss you book by selling should be equal to the gains. I have lost almost 4 Lakhs in this Short term Bank nifty and Options. but didn’t get any profits. In the middle i got but i have invested that amount also so i lost totally 4 lakhs with out any gains over all this year. .. so Do i need to show to the income tax that I have lost the amount. will it be considerable if i gain in future. As per my understanding of the information on STGC on the incometaxindia.gov.in website. If you’re income is less than the taxable limit, STGC will be adjusted in the personal exemption slab and only the value exceeding the exemption limit will be taxed at 15%. Eg1 : if your income from other sources is zero and the STCG is 2lakh then you’ll have to pay zero tax as it’s less than 2.5L slab. Eg2: your income from other sources is 2L and your STCG is 75K. Here the total will come up to 2.75L. So for anyone below the age of 60years, 25k is exceeding the exemption slab of 2.5L. So in this case STCG tax of 15% plus cess will be levied on the excess 25000rs. I incurred loss of about 34k in intraday. I got profit of 13k in cnc short term. Which gets to net loss of about 21k. Do i have to pay 15% tax on 13k cnc profit? No, you are net in loss, so no taxes. I have made a profit of 12000 rs (Delivery + Intraday equity) and loss in Future trading of 12000 rs. Does it nullify when we compute tax for the current year. nithin, where in zerodha i can get my consolidated trading statement to get profit/loss for FY 17-18 ? Thanks Nitin for your valuable inputs. I may save some tax this year with harvesting. However when I sell the same stock next year in June, what I saved last year will get added to my profit and has to pay tax on it next year. So you are only carry forwarded tax liability by tax harvesting. There are also below disadvantages. 1. Stock will show profit probably from next day without considering the loss you has occurred on the same stock last FY. 2. Also we have to keep a separate record of old buy price and loss in order to know break even point to make actual profit on the stock. 3. In above example if I didn’t got for harvesting I could have paid only 10% tax under long term capital gain. We have T+2 for delivery system. Then selling of stocks to book losses; is it not necessary to sell on 26 March considering 28 March is last trading day for this year. Also if we sell today; can we buy tomorrow? Trade date can be considered for sell transaction. Till date I have REALISED PROFIT₹-20,458.20, TOTAL CHARGES₹3,581.74, UNREALISED PROFIT₹-15,449.95. And also I have some holdings which are in lower circuit so I cant sell it because there is no buyer. 1 I sold today, 1 with loss of Rs.2000 and other with loss of RS.18000 , in this case what should I do for tax as well as to close these positions.Total Holdings with unrealized loss of ₹-17,949.20. Please give any suggestion to plan my losses properly. hi i am student and i dont have any other income and i joined zerodha last month and i invested 17k and currently my holdings are in loss, so will i still have to pay the tax ?? will i have to sell my all holdings and buy it again ?? No need to pay tax if you don’t have profits and total income mroe than 2.5lks. I was trading since 1.5 month..but I loss 3000 rs from my capital…will I give tax? No taxes unless you have income over 2.5lks. tax only if u profit. if i book loss tomorrow to adjust tax on short term gain, whether loss will be accounted in the current financial year as the actual stocks will be debited on T+2 (i.e. 2nd April i guess). I am a student (19 now) was not completely 18 years old in the financial year 2016-17 and i made about 10k realized profit and 40k unrealized loss.. Do i need to file an ITR?? No taxes to pay, but best file ITR. Sir this year , i lost 1,44,000/-₹ total in parts …in trading whole last year …like 10k in crude , than 10k in equity again come back with 10k in equity than again come back with 50k and loss in nifty + stock future . I am a student , dont have any source of income as all those was me n my mother’s saving, i dont know whom n where to file ITR . Please suggest me sir ! Can we do loss harvesting between demat holding shares & smallcase shares? Also is it applicable to if I have STCG is less than 1 lac in FY? Hi. Sorry for your loss. You are not required to sell and buy back (loss harvest) as you already have negative returns. Current year I have a loss of 3 lacks in intraday. Can i show this loss in filling my ITRETURN? My income is 4 lakh, my wife is housewife & she earned profit 1 lacks from my capital balance.it is taxable or not. No tax unless total income over 2.5lks. 1) Will I be able to carry forward the loses for next fiscal year? 2) If yes How long? 3) I also have some losses in commodity so Can commodity trade loses be also carry forwarded? 4) Turnover is around 55lakhs so do I need a CA to file my ITR? I am a working professional and my income is around 3lakhs. Any help would be greatly appreciated. 4. Best to use CA. Great article! Thanks a ton. One clarification please regarding your comment “You can harvest loss using either of the below actions before 28th March 2018 (last trading day for FY 17/18).” – Can we do it till 28th March ?? I was given to understand that last day for this kind of exercise should be 26th March since the settlement for all trades done on this date would be done on 28th March, after which the stock market will open on next financial year. You can consider sell date as trade date itself. Sir me me monthly investment kar raha hu 2500 rupees alag alag stock pe20 years ke liye kya shahi hai? Can we do tax harvesting on 28th march by selling on 28th ?? On 27th March, I sold few shares as a part of tax loss harvesting. Can I buy same shares on 28th March with same quantity? ->Accordingly to “Wash rule”,if you sell stock for a loss and buy it back within 30 days before or after the loss-sale date, the loss cannot be immediately claimed for tax purposes. Please clarify, whether to buy same share on very next day ( 28th March) or not? Sorry Nithin, it’s Auto type error ? Yeah, in India there is no wash rule defined. Why is there a need to wait till next trading day? Why can’t I sell and buy at the same time? Will it be considered an intra day trade or something? Will it be considered intra day trade even if I select CNC when placing those orders? Yes, if you sell and buy, it becomes intraday irrespective of the product type. Are FnO losses shall be accounted together with Equity gains or calculated separately? Im in profit of 5L in equities but in losses of 2L in FnO? How to calculate gains? together (3L profit) or separately? Is there anything like Wash sales in India? PS. I am a new investor in Market. Learned everything from Varsity. Thanks for that! Not defined in law yet. What are the rules regarding “wash sales”? For tax loss harvesting Can i sell stocks with unrealized loss and buy them again on next day? Will that help me to reduce taxes? Or is there any time limit within which if i buy the same stock I will not benefit from tax loss harvesting? if i have a tax loss harvesting opportunity of 5 lakhs does that mean i have to sell 10-20 lakhs worth shares booking 5 lakhs short term loss and offset from the shortterm gain. will this not be only for taxation purpose. wont i be really losing value of my portfolio even if it is (false) assuring that i will keep the same portfolio. by this arent we making unrealised loss into realised loss ? Yeah, but you can always buy back your stocks. Does this really matter to do tax harvesting on end of Financial year? or Should we just consider only the 365 day period to do tax harvesting? 2- Price decreases the next trading day, and I buy again – so it “looks like” beneficial. You have to file your income based on FY. So if this FY if you have realized gains, you have to pay taxes. This can be avoided by selling and booking losses. Its very great that you share such a wonderful and informative articles. I fall under 20% bracket and currently I have Short-term profit₹-764.70. I’ve further equity in my demat which are ₹-4,371.30 and not completed 1 year. Shall I sell and repurchase tomorrow to save tax of around 1000 Rs? What is the last day when I can sell and save tax. Both are in loss, so no point selling and buying back. My query is, I sold some shares which were showing loss in my holdings on 27th of March 2018 after reading your informative article on tax loss harvesting. But I am now wondering that since settlement happens after T+2 day and March is left with only one trading day as 29 and 30th are holidays in India. Will I be able to do loss booking or was I too late to book losses? Riyas, what stoploss you use is completely up to you based on your risk appetite. First of all I want to appreciate u for your efforts (kite 3.0 , UPI, Support portal ) to take Zerodha to high levels. I have referred and recommended Zerodha to many of my friends and family members & many are using Zerodha. Very sad to say this, Now a days there are errors in the Contract notes especially while SELLING the options and also the average price is being adjusted wrongly while the sell position was carry forwarded. I have mentioned about the issue to the support team via phone and also by ten days time span I have raised Two Tickets about the issues. Ticket N0: #20180321398351 on March 21 2018 while selling options I made a profit of nearly Rs 7000. But profit money was not added to my account instead they deducted money nearly Rs 7000. I called the support team they argued regarding it , as I had trust and confident on Zerodha I thought myself there was some mistake on my side. After that I had closely watched my trading activities. Again the problem happened on March 28 2018 I raised compliant Ticket NO :#20180328347323 this time I made a profit of nearly Rs 9000. Instead of crediting profit to my account they send me a contract note that I made a loss of Rs 11880. Before days if we write to Support team they used to analyse the problem and the reply will be in a prompt manner. While I sent the problem they telling the difference between Option Buying & selling. As I m bit experienced in trading, so only I m selling the options. The reply I got from support team was annoying and unacceptable, while the average price problem happened initially the support team didn’t accept it, later the problem was corrected. Now a days these things forced me to take screen shots daily because the support team always denies when there is a error. Now a days I m always facing problem in selling options in terms of Average price and booking profit. Daily making calls to the support team and sending mails which is very tried during hectic trading sessions .I hope u can understand how difficult it is in a traders point of view. Please do take necessary action as earlier as possible as i m daily representing to the support team either through phone or mail. I am a customer in zerodha my id is ZU5388 I am an engineer and I tried for a vacancy in zerodha but no positive results and I have little knowledge on day trading and I wish to work for zerodha ? My client ID is RP7493.. have raised a ticket and called multiple times regarding my tax P and L .. It shows incorrect data.. I have attached a screenshot as well in the ticket.. have been waiting for a response for a while now.. Would appreciate if you could look into the matter. I had bought 20 OIL shares in FY 2014-15 and sold 26 OIL shares in FY 2017-18 at a loss. I had received 6 bonus shares in 2017. Zerodha tax reports is showing the 6 shares as short term capital gains with a buy value of zero. Please advise whether this is correct or whether the system was unable to account for bonus. 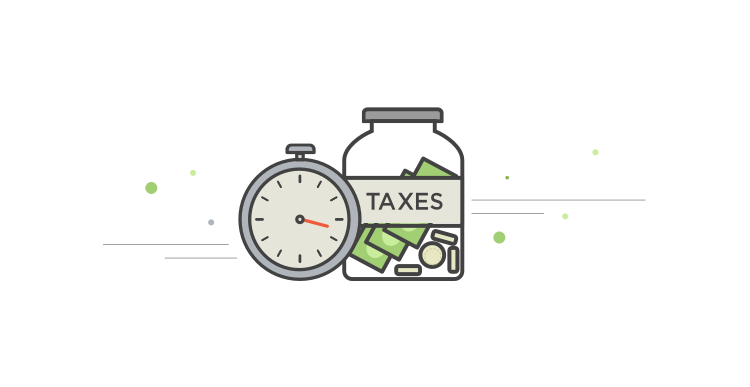 Should I show 26 Long Term Shares while filing my Tax? This is correct (our P&L report), bonus shares are new shares issued by the company at 0 cost. I have done interaday, short term and FnO. 1. Can you please confirm under which schedule of ITR3 each one of these should go. 2. My confusion is mainly due short term and FnO because CFL schedule has 2 separate columns for ” loss under income other than speculative business” and “short term loss”. I suggest you check out the taxation module on Varsity. I have filled ITR-4 SUGAM (Presumptive tax scheme) in year 2016-17 inspite of real net loss. I this year 2017-18 I have incurred net loss arround 2.9 lac , and Turn over is approx. 12 lac. Can I carry forward this loss? Whether CA audit is required or not? Which ITR I have to file? If in this year 2017-18 i go through tax audit , then for comming next 5 year will audit mandatory? Yes, Audit is required if you want to carry forward the loss, which can be set off in next 4 (Speculative loss) or 8 years (business loss) . For more information, please contact me rbala78 @ gmail.com. For capital gains calculations for multiple transactions of a share FIFO (First In First Out) method is applied. However is FIFO method applied across various demat accounts? If I have purchased 100 HDFC shares via Zerodha on 01.01.2015 and buy 100 shares of HDFC on 01.01.2018 on xyz demat and I sell 100 shares from xyz demat. Will LTCG apply since I 1st bought in 2015 or will STCG apply since I am using XYZ demat and bought the shares in XYZ in 01.01.2018? In an ideal situation FIFO should be applied across multiple demat accounts, but since there’s no way to do this programmatically since each DP would have it’s own reports, generally, it’s done per DP. I have sold a stock xyz on 3-Sep for 1L loss in NSE. If i bought same number of stocks again on 4-Sep – next day morning , will be considered as tax harvesting with a loss for tax calculation or should i wait for T+2 days to get the same stock for booking loss ?!?!? please advise. Do we need to pay Advance Tax on capital gains as this is completely out of prediction? Can I offset short-term or long-term loss from sale of stocks against dividend distributions from MFs? I have been wanting to sell off a few of my holdings in companies which I do not think have good long-term prospects. Now with the market down, my losses in these stocks have further increased. However, I still feel that selling the poor businesses at a loss and moving the proceeds into better businesses at this lower market level would be best. I want to offset the loss against some other profit. I just remembered that my ELSS MF distributions will be attracting 10% tax starting April 1 2018. Hope to harvest the loss and offset that loss against MF dividends. STCG/L can only be offset against LTCG. The dividends don’t fall under that category.